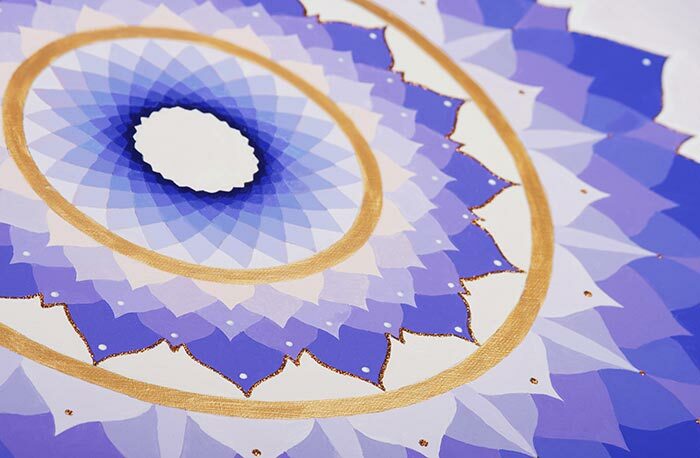 The word “mandala” itself means “circle” and, often, that’s what a mandala looks like. A circle. Circles have a very evocative meaning in Hindu and Buddhist religious traditions. Mandalas arose in Indian and Himalayan religious traditions as artistic ways of representing the spiritual universe. The ancient Hindu scriptures think of time as circular, having a creation period, a period of flourishing existence, and a destruction that leads to another inevitable creation. Modern mandalas we can see in coloring books or contemporary artwork are used as means to reduce stress, connect deeply with oneself and appreciate forms of beauty in the world. Many of the mandalas we encounter come out of the Tibetan Buddhist tradition, where the spiritual meaning of the work is to represent the pure and sacred realm of existence created by a Buddha. These are usually highly detailed paintings done in the “thangka” style, characterized by rich colors and extravagant depictions of Buddhist and Hindu cosmologies. In the Indian Hindu tradition, mandalas are also used to depict the spiritual universe, but the word has an additional religious meaning, referring to the ten sections of the Rigveda, one of India’s oldest canonical Hindu scriptures. In Hinduism and many forms of Buddhism, this cycle is constantly occurring and reoccurring. In their first encounters with the idea of the mandala, many Western religious leaders, scholars, and, crucially, some psychoanalysts became fascinated by this concept. Much work was done by the Swiss psychoanalyst Carl Jung to expand the definition of mandala to make it relevant to the spiritual and psychological life of the modern western person. Jung’s idea was that through regularly painting mandalas, a person could create a dialogue between their “true self” and their “ego,” integrating the two over time. Symbolism was once the only way that ancient man could understand the world around them and make sense of complex situations. Before the development of scientific theory, religious and spiritual symbols and concepts were crucial for understanding bad weather, crop failures, and sudden successes. We might have more rational and logical methods to use now, but that doesn’t mean that spiritual symbolism is completely useless. Lotus mandalas appear often in Japanese and Chinese Buddhist art. The lotus, a flower that grows in shallow water, emerges in elegant symmetry from the murky soil beneath the water’s surface. It represents enlightenment rising out of suffering and impurity. 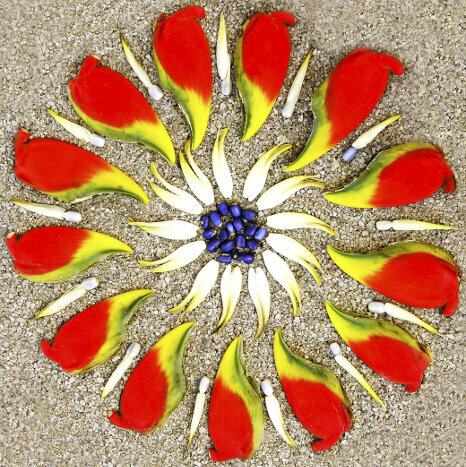 Sand mandalas are a Tibetan Buddhist practice of making elaborate mandalas out of colorful grains of sand. Once complete, the mandala is destroyed. The creation and destruction of the mandala represents the creation and destruction of the universe and the impermanence of all things. If you live on the coast, you might try making a mandala at the tideline on your local beach. As the waves sweep away the creative work of your innermost being, think of impermanence and feel newly cleansed. Look deeply into a rose, a wildflower, the newly unfolding petals of a peony. Flower mandalas appear in nature, and also in art. One of the most famous modern mandala renderings is a white flower mandala made by one of Jung’s patients. Flowers have special evocative powers, often connected to their color and shape. When you paint a flower, think about the color meaning of the image and try interpreting it from this perspective. Sun mandalas can have a directional component and may imply radiant light. Think of the Native American medicine wheel, symbolizing the four cardinal directions and their different energies. Think of alchemical treatises that use the sun to symbolize gold, which in turn represents purity and the highest possible transformation. In our modern world, we’re fortunate to be able to connect with the wisdom of so many different traditions. We blend freely and benefit richly. Jung’s attempt to unlock the power of the mandala for the western subject was just one step in a long process of coming to understand ourselves through new spiritual traditions. We should all continue this creative work, but its important that we remember to always do it with care and respect for the place and context we’re learning from.